The do-it-yourself hobbyist market, particularly in the area of electronics, is hotter than ever. 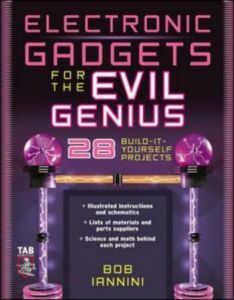 This books gives the “evil genius” loads of projects to delve into, from an ultrasonic microphone, to a body heat detector, and all the way to a Star Wars Light Saber. This book makes creating these devices fun, inexpensive, and easy.